For those obsessed with the results on Tuesday night, here is a November 4 guide to watching television and searching exit poll data on the web. There are three basic questions (with hundreds more to follow in the weeks ahead): 1) When can you feel confident about the outcome of the presidential contest? ; 2) How well are Democrats progressing toward their goal of 60 seats in the Senate? ; and 3) Will 2008 be another Democratic blowout, signaling the possibility that the party could establish a majority coalition in future elections? The basic rule of thumb is to follow the closing times of the polls in each state. Once voting is stopped, the networks can start using detailed exit polling and post the material on their websites. If the networks are unwilling to call a given state, an examination of the exit poll data can often give you a clear signal of the ultimate results. The state-by-state exit polls released after poll closings will have large samples and should not suffer the defects that plagued the early findings in 2004 which pointed to a solid Kerry victory nationwide. Fortunately for those who cannot stay awake, some of the first states with earliest poll closing times of 7 PM EST are key battlegrounds: Indiana, Georgia, Virginia, and Kentucky. Virginia is a crucial battleground state, and an Obama win there (without Georgia or Indiana) would suggest he is likely to take the oath of office on January 20. In terms of the future, an Obama victory would mean that Virginia has completed the move from red to purple, with all the demographic changes pointing toward further Democratic gains. If Obama carries either Georgia or Indiana, look for a big Democratic night all around. If he carries both (along with Virginia), Republicans should consider turning on the gas and closing the windows. Those who care only about the presidential outcome should feel free to switch to sports, watch a movie, or go to bed. Conversely, if McCain carries Virginia, Indiana and Georgia, plan to stay up a little later. The Kentucky Senate race, pitting Republican Minority Leader Mitch McConnell against Democratic challenger Bruce Lunsford, a businessman and U.S. Army veteran, is a crucial contest in the fight for filibuster-proof control of the Upper Chamber. McConnell has a 5.7 percent advantage according to RealClearPolitics and a Democratic victory would be a major upset. Another upset could be in the making in Georgia where Democrat Jim Martin has been closing the gap in his challenge to incumbent Saxby Chambliss, although Martin remains 2.7 points behind. If Georgia goes for Martin, it will indicate that black voters are turning out in droves, mobilized by the prospect of electing the first African American president. Just a half hour after the data from these states starts pouring in, polls close at 7:30 in the Big Enchilada of 2008: Ohio — and may close in another important state, North Carolina, although officials there have the option of staying open until 8:30 if there are problems in completing the voting process. Ohio has become the national battleground state and this year is no exception. Carried twice by George W. Bush, this year Obama is favored, with a 7 point edge, but neither side is taking it easy. The closing Ohio trend line has been in favor of McCain, who in recent days has cut in half what had been a double digit deficit. The presidential race in North Carolina is a dead heat, and has been so for a month. The RCP average has Obama ahead by a statistically meaningless 0.3 percent. An Obama victory there would be another strong sign of a good night for the Democratic nominee and his party — especially if combined with an Obama win in Virginia. North Carolina Senator Elizabeth Dole (R) is fighting for her life against Kay Hagan (D) in the Tar Heel state. Hagan holds a 5.5 point advantage and appears likely to pull off an upset win, but the big question is whether Dole’s last minute airing of highly controversial commercials linking Hagan to a “Godless” supporter gains traction. At one point, Obama supporters had thought West Virginia, where polls close at 7:30, was within reach, but in recent surveys, the Democratic nominee has faced a double digit deficit. The flood of voting results and poll data begins at 8 PM EST. In the presidential race, hotly contested states include Florida, Pennsylvania, Missouri, and New Hampshire. In addition, there are two crucial Senate races: Sen. John Sununu (R) v. Jeanne Shaheen (D) in New Hampshire, and Senator Roger Wicker (R) v. Ronnie Musgrove (D) in Mississippi. Of the presidential states with 8 pm poll closings, Florida is by far the most important. RCP’s 4-poll average in Florida gives Obama a 4.2 point edge over McCain. If that holds up, Obama would be well on his way to victory. 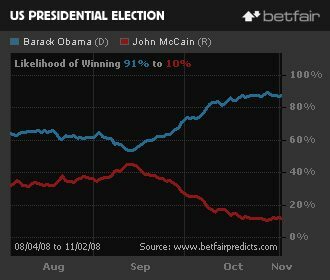 If, conversely, McCain wins Pennsylvania while holding Florida and other states carried by George W. Bush in 2004, it’s a whole new ball game, and a late night: you will have to wait for returns from Colorado, New Mexico (both 9 PM ET closings) and Nevada (10 PM), to have any real confidence in the outcome. The networks will not go anywhere near calling the race until the polls close on the West Coast at 11 PM. Barring the Pennsylvania-McCain scenario, the odds are that the winner will be known to anyone following the results once the states with 8 PM closings are in. There will be plenty of interesting results coming in from the states in the Central and Mountain time zones — especially Senate races in Louisiana, Minnesota, Colorado, and New Mexico. In addition, House results will be constantly trickling in. Unfortunately, it will be virtually impossible to ascertain early whether Senate Democrats will hit the magic number of a 60 seat majority, unless Republicans win in some of the early states listed above, in which case it will be possible to rule out a Democratic super-majority. In the event that Democrats keep winning in every key state, those who can’t go to sleep before they find out will have to wait at least until the votes are counted in Oregon, where the last polls close at 11 PM EST and where Democratic challenger Jeff Merkley leads incumbent Gordon Smith by 5.3 points. If Democrats are still on the cusp, with 59 seats, when Oregon’s results are counted, it will take until the polls close at 1 AM EST in Alaska to be sure of the balance of power in the Senate. In Alaska, recently convicted incumbent Republican Ted Stevens looks like a probable loser to Democrat Mark Begich, who leads by 10.3 points — although no one is going to state publicly that Stevens is politically dead until the results are officially declared. There is an even worse scenario for those with a desperate need to know: The Democrats could be at 59 Senate seats at 2 AM on November 5, but, when all the votes are counted in the Georgia race, a number of experts say that a reasonable expectation is that neither Chambliss nor Martin will reach the 50 percent required to win, and that Libertarian Allen Buckley will siphon off enough votes to force a run-off later in the month.